With immense pride and pleasure we bring to you Sleepsonic bedding products from the house of MRFI Pvt. 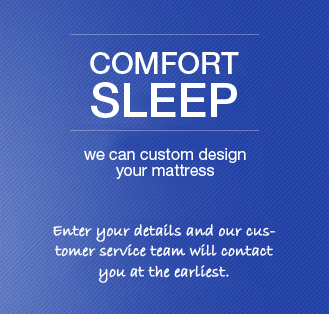 Ltd. MRFI is a company engaged in manufacturing of exclusive bedding products for over three decades. Combining together our expertise along with ongoing market research, we introduce our exceptional range of Sleepsonic products. Every product we manufacture is the result of our uncompromising approach and emphasis on correct back support, posture and orthopedic needs.We are amongst the fastest growing mattress brand in India and have a product line catering to every segment of the market. Sleepsonic offers you an opportunity to join hands and mutually work towards business success. As a part of the Sleepsonic family you will enjoy full support and expertise of a stable and growing group that is determined to succeed. Our highly efficient and skilled team will provide you with appropriate management and marketing strategies, administrative advice and expertise assisting you to take all the right decisions thereby resulting in a successful business venture. We at Sleepsonic work towards achieving our goals in the most professional and hassle-free way possible, making the entire experience an enjoyable and fruitful one. We provide you with round the year support and training and all the necessary tools to succeed.